I figured there are so many negative posts, I would flip the script. This morning my daughter gave me a homemade birthday card. It was Star Wars themed! She wrote out her favorite villains (Bossk, Dengar, and Emperor) and her favorite Heroes (Chewie, Leia, and Luke). She also drew a picture of her and I playing. My wife jokes this is a sign I play too much, I contend this is evidence of great parenting! Great parenting! I got a similar card from my son on Father's Day. I think it's a sign that you and your daughter have something that you enjoy together, which is just fantastic. Play on @Wallofman and wallofdaughter! Firstly, happy birthday? Second, seems like great parenting in my book. Oh, yeah, Happy Birthday Wall! I have a 2-year old so I only play when he's sleeping but I'm sure we'll game together when he's older. But if he, for example, would go and give me my game controller or something I would be worried that I indeed do play too much. But just giving you a card based on something that you guys enjoy together is in my world a sign of good parenting being that she probably gave you a Star wars-card - of all things - because she herself also enjoy this. Any time you spend with your kids is great parenting. I'm lucky my wife and little guy love Star Wars. I play too much but I mostly play with my son. I scold him for his mistakes and encourage him to play better (and the objective). That's great parenting. A young jedi you have. Parenting win... As long as you don't let your kid use Disruption. Just kidding, if you two have a passion for the same thing, that just brings you two closer. Parenting win! I think she is more a Sith. She loves playing as Vader, not sure why she did not write him down. She plays the Hero battles and loves throwing the lightsaber and doing the force choke. Now I will say the other night she decided she wanted to talk back to me when it was time for bed. She actually said "You're going to take a dirt nap" when i told her to get in bed. I had to walk out of the room so she wouldn't see me laugh. Thanks everyone, I figured we have so many threads with people going after each other, talking negative etc. 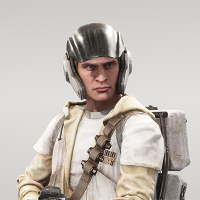 I thought it would be good to have a thread to remind us why we all bought this game to begin with, to play Star Wars, even with all of its issues. Nice!! 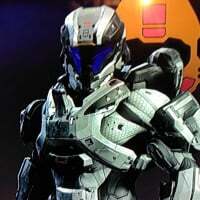 I have played many battles with my son (11) and daughter (8), they both really like the game. Skirmish was a nice addition as we could also play at the same time. Kind of related, our family is obsessed with Star Wars. A few months ago my mother in law found some old toys in their attic including the black Darth Vader carrying case for the old little figures (anyone in their 40s knows what I am talking about Inside there were a whole bunch of figures including bossk, dengar, boba, chewy,greedo,Han etc. they thought it was hilarious! We would setup the figures when playing HvV! I wish I had my old figures. My house caught on fire when I was 14, and my stuff melted. At that point I was into football, lacrosse, etc so I did not care to get new ones. And yes, sadly, my Vader head melted. Along with my Falcon. The AT-AT looked like it belonged on Graveyard of Giants. 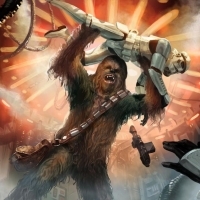 I think it would be awesome to have these figures to have a live action HvV. Playing the game has allowed her to appreciate the movies better. Easier for her to relate. 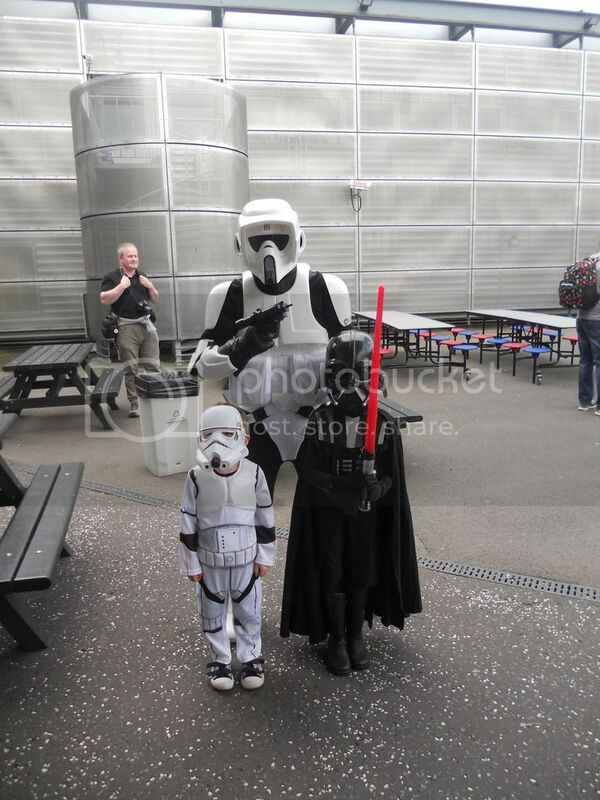 This is me with my daughter as Darth Vader (and her friend Jonathan as the Stormtrooper). I'm with the 501st Legion and she's in the Galactic Academy (as Vader and Leia too) and this was our first troop in costume together. It's evident that you have a better relationship with your child than Anakin did. This is relatable to me now my family is crazy obsessed with star wars like yours now my dad and mum not so much but my 2 girl cousins my gran and my papa and my aunty and my uncle. My uncle is who i get on with the most but because he's the most into star wars and gaming like me he has hundreds of star wars figures and ships and we can't wait until rouge one comes out my uncle is going to the midnight release and i will be seeing it sometime after I was annoyed last year but because i didn't go to see star wars the force awakens on the midnight release i seen it a bit after but the first day after when it came out I go back to school they say a massive spoiler about it you guys know what I'm talking about. Awesome! I love the 501st and plan on joining! You should! I've had so many awesome experiences since joining, and it's all for good works and charity as well. I have made some good friends and learned more about the costumes of Star Wars than I ever thought I would. Is this seriously a question? 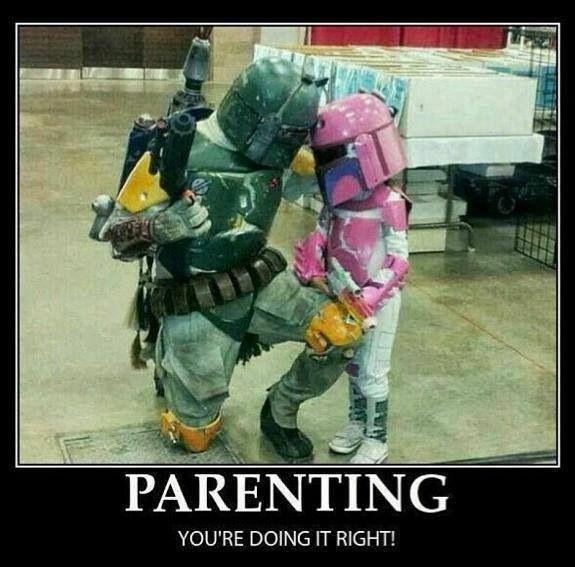 Parenting win for sure! anytime you and your kid share something fun it's a win.